Last week Wales Online published this list of ‘37 incredible things you have to eat in Wales right now‘ and we were delighted to discover – through the wonder of Facebook – that one of our delicious cupcakes made the list. The same list as Joe’s Ice Cream!! Apparently our Salted Caramel Cupcakes are incredible and a must-have if you’re in Wales. 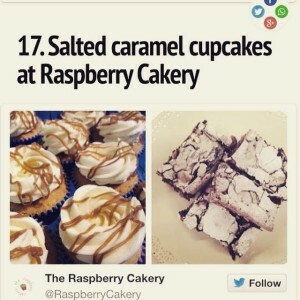 Thank you, whoever put us on this list, we’re very glad you enjoy our cupcakes. If you haven’t tried one yet, come on down to the Cakery to taste for yourself!